As I mentioned in my last post, the main impression we’ve taken away from two nights in Deheishe with our host families was, quite simply, genuinely delightful time spent with wonderful new friends. But of course it’s not that simple at all. Just as it’s been impossible to ignore the truth of our common humanity, it was impossible for me to ignore the inherent inhumanity imposed daily upon the residents of Deheishe. It was palpable in so many ways. During the course of dinner, the electricity cut out on us more than once. At one point, we sat in the dark and I looked out at the window at the bright lights of the nearby settlement of Efrat. From this vantage point I thought of their beautiful homes, their well-tailored landscapes, their swimming pools and I was just emotionally overwhelmed with the injustice of it all. The people we have met in Deheishe are so gracious despite this reality – their children so smart, so filled with life and love – and all I can think of is the waste of it all. Such incredible human potential forced to live in a virtual box, with little hope for a viable future. I felt a similar feeling yesterday, in Wadi Fukin, where residents lived in the shadow of a fast growing settlement that pumped human waste into their village. I asked myself the same question: how can Jews, of all people, do this to another people? And how can we allow it to happen? It is clear that there are two very different universes in this country: Jews live in one and Palestinians in another. It’s a reality that is impossible to ignore – and if there was any doubt, our trip to Hevron this afternoon drove this point home for us in a painfully obvious way. I’ve written about the horrid situation in Hevron from previous trips. A few hundred Jewish settlers live in the heart of the city, protected by 2,000 IDF soldiers. Palestinian presence is severely restricted or is outright prohibited in the Israeli-controlled part of the city known as H2. As a result, what used to be the bustling main commercial area has been rendered a virtual ghost town. Take a close look at the picture above. In the foreground you’ll see two Jews strolling down the center of the street, which is legally off limits to Palestinians. The men in the background are actually Hevron city officials, regulated by law to the narrow walkway on the side of the road. This is racially enforced segregation. By any other name we would call it apartheid. As we walked through the streets, our Israeli tour guide, Kobi, told us about his army service in Hevron – how he personally witnessed the brutality of the IDF toward Palestinians, and how this experience sealed his own personal transformation from an extremist right-wing Kach supporter to an Israeli peace/justice activist. We then passed through the checkpoint into the IDF-controlled area of the city and entered an area that is technically off-limits to our Palestinian tour guide, Aziz. He asked me for my kippah, which he then put on his head so he could pass for a Jew and take us down Shehadeh Street (see below). Although Aziz was characteristically good-natured about it, it was profoundly disturbing to us. One member of our group said she was moved to tears to see Aziz, a Palestinian man, “protected” by my kippah in a Jewish-only part of town. We walked back to our bus through the Palestinian-administered streets of Hevron (H1) and took some time to have lunch and do some shopping in the souk. Along the way Aziz and Kobi pointed out one prominent Jewish settlement that was built literally above the Arab shops. In the picture at the top of this post, you can the settlement marked by an Israeli flag. 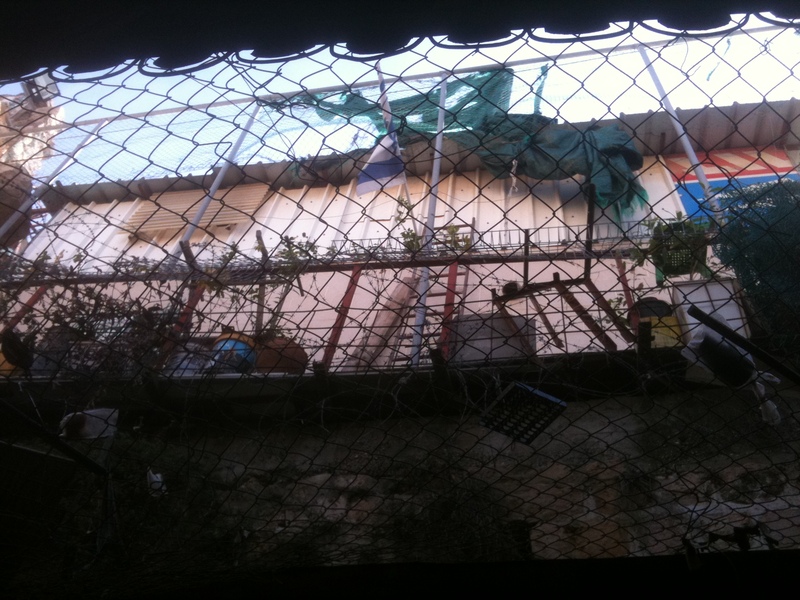 You’ll also see a chain link fence that was put up to protect the Palestinians below from garbage and debris that is regularly thrown down at them from settlers. After Hevron, we visited Tent of Nations, a Palestinian family farm located south of Bethlehem. 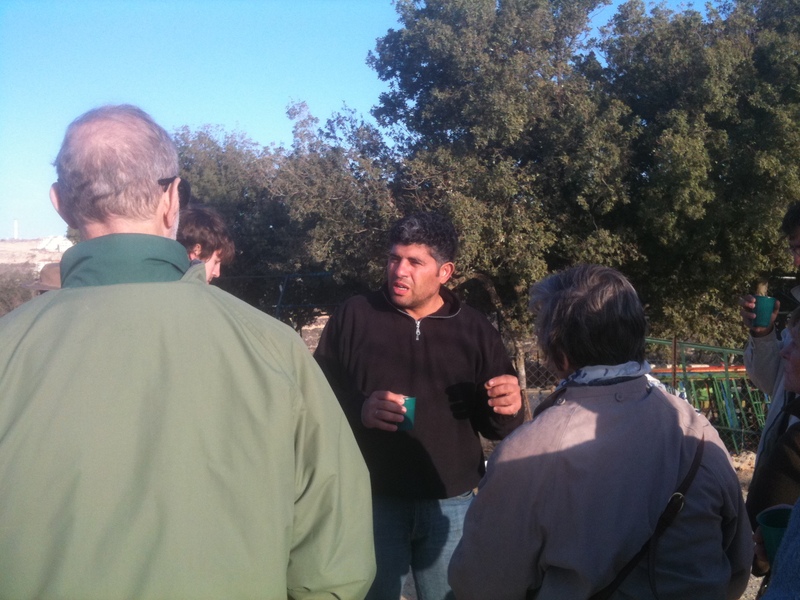 It is owned by Daoud Nasser (below), whose family has owned this land for four generations. His grandfather registered his land with the ruling Ottomans and the Nassars still have the original deeds of ownership from the Ottomans, the British and the Jordanians respectively. In 1991 the Israeli military initiated proceedings to expropriate the Nasser’s farm, which happens to be located between two Jewish settlements in the Gush Etzion Block – which is considered choice real estate by the Israeli settlement regime. Despite Daoud’s irrefutable proof of his family’s ownership of the land, the legal battle over it has stretched on for well over two decades – and the Nassar family has spent over $140,000 in legal fees to date. Last May, the Israeli military issued demolition orders because the Nassers added some minor but essential additions to their property. Thanks to an international solidarity campaign, they were granted a stay by the Israeli courts. At present, their case remains in Israeli legal bureaucratic limbo. In the meantime, the Nassar family has used their land to establish “The Tent of Nations” an inspirational center that provides arts, drama, and education to the children of the villages and refugee camps of the region. Daoud and his family have also established a Women’s Educational Center offering classes in computer literacy, English, and leadership training. Many rabbis and rabbinical students are familiar with Tent of Nations as a primary destination for Encounter – a well-known educational program that promotes coexistence by introducing Jewish Diaspora leaders to Palestinian life. Daoud is one of my personal heroes – a gentle, visionary soul with a powerful, implacable moral core. I first met him last year when he passed through Evanston on a speaking tour – and it was a thrill for me to finally introduce him to members of my congregation. I can only say that after our painful experience in Hevron, ending our day with Daoud on his family farm was healing indeed. 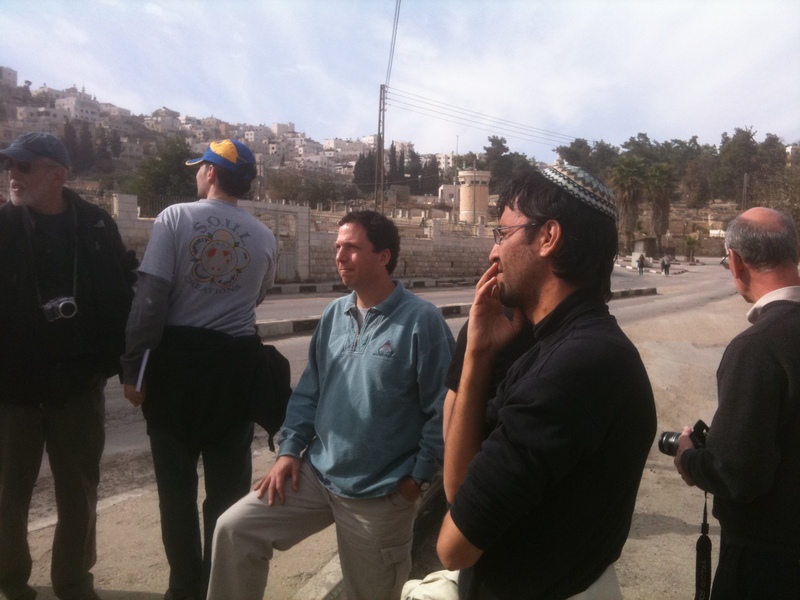 This entry was posted in Human Rights, Israel, JRC I/P Study Tour 2010, Nonviolence, Palestine on December 25, 2010 by Rabbi Brant Rosen. Hard to read, very powerful and extremely important. This trip is literally awesome to read about, and your photos do so much to illustrate this story. Thank you for shining a light on this. I am forwarding this to many. Bravo to the courageous members of your congregation who have been willing to experience the roller-coaster of emotions I am sure they are feeling. While at home … this week’s headline in the NYT reads West Bank Settlement Boom Sows New Obstacles to Peace Deal. The Israeli administration’s strategy of taking the land piece by piece by piece continues unimpeded. Pray God, how can we turn this around? Generational post traumatic stress disorder is my belief on how Jewish Israelies and than other Jewish people support the Israli tacts. If I was yougner I would do research into the subject. Brant, Thanks for the update. Your efforts to report on what you see are so important. This is hard stuff to read… but must be read. 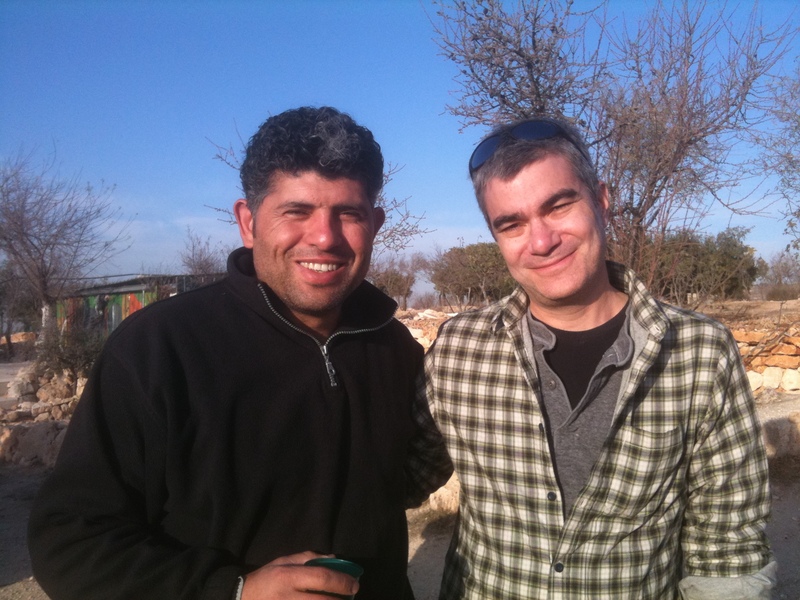 Aziz and Kobi–my dear friends–are leading this tour. We take groups to the region by-in-large to help the courageous ordinary people who are peacemakers in Palestine and Israel. Supporting people who are ‘being the change they want to see’ is something YOU can do too. There are hundreds of organizations consisting of tens of thousands of people doing the day-to-day work of connecting ordinary people across ‘enemy’ lines. Study this list: http://www.peacengo.org/organizations.asp Pick an organization or two that you think could use YOUR help in one way or another and help them. It is remarkably easy and extremely rewarding. That photo of the Jewish couple strolling down the street in Hebron is very powerful. When I see pictures like that I often wonder what is going through the minds of the people in them. Your article fails to mention the weapons that Hamas has been smuggling weapons and will continue to do so under ” humanitarian aide”. I’m sure there are many Palestinians who want peace, but the government still Glorifies terrorists and promotes hatred of all Israelis as well as jihad in their classrooms. When Israel gave them the gaza you saw what they did, just got closer to shoot more rocket launchers. I have been to Israel 17 times and volunteered there 14, and I would like an Israel to be there to return to . So please don’t be so naive and wake up to the real situation!